What we call nature... is a poem hidden behind a wonderful secret writing; if we could decipher the puzzle, we should recognize in it the odyssey of the human spirit, which in astonishing delusion flees from itself while seeking itself. Beginning in the late 1960s, and continuing in ongoing, open-ended series, Sigg’s abstract handling of form, light and color stood in for the aesthetics of nature itself (subsequently developing into abstract signs of nature, culture, and the self). Sigg’s early abstractions are equivalents to the sky’s gradations of light and color, clouds and mists hanging over mountains and horizons. These effects of light and color, called atmospheric perspective and observable in the far distance in nature and in illusionistic landscapes, reveal Sigg’s careful observation and transcription of subtle events of the natural world. But there are no mountains, and there are no clouds or overlapping near-, middle- or far-distances in Sigg’s landscapes, no mathematical perspective to fix or focus our gaze. 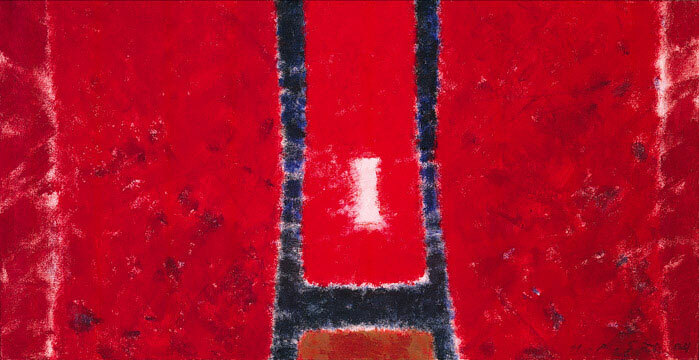 Instead, at first sight, there is a beautiful minimal image, a hallmark of modern abstract painting that stresses and experiments with the flatness of the picture plane to create a new ethos of “painting for painting’s sake.” Favoring beauty of form and color over realism of any sort, it formulates a new concept of space in painting, a new perspective, both literally and figuratively. 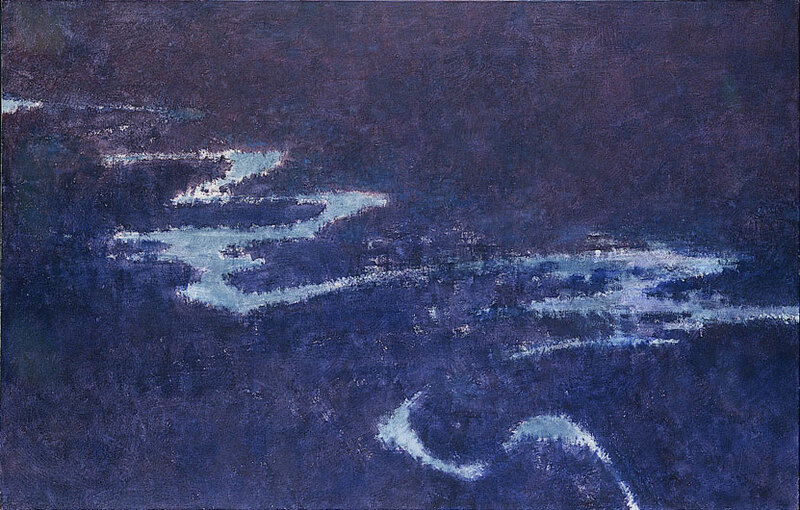 In Sigg’s paintings, calligraphy and gesture are captured, distilled, and quieted, changing the terms of encounter with the object from contemplative to meditative, and adding the new term of the sign.5 In works like The Course of the River V (1985), uninterrupted cursive lines, as if seen from above and straight ahead at once, wind through and float on a field of modulated brown tones. These are surrogates for the river and the land. This gesture is just one step away from the sign for the river that changes course and appearance, here a flowing gesture, later a rapidly and repeatedly executed character. Both are similar to Asian calligraphy, practiced day by day to perfect the artist’s control and expression. But whereas the character is fluid in this series, like a river it will take on different forms, contexts, and roles in other series. Notably, Sigg’s structures are largely symmetrical although at times asymmetry also appears. He is much more straightforward than the Americans about his inspiration in nature (as we can see in many of his titles) and in Asian art and culture. 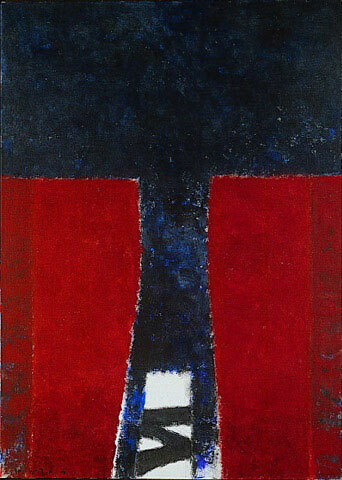 In virtually all of his series he more thoroughly investigates the possibilities of abstract landscape and the aesthetics and philosophy of the East, testing boundaries with interplays of language and image, symbol and sign, physics and metaphysics, while intimately experimenting with color, light, space, and optical and tactile qualities. 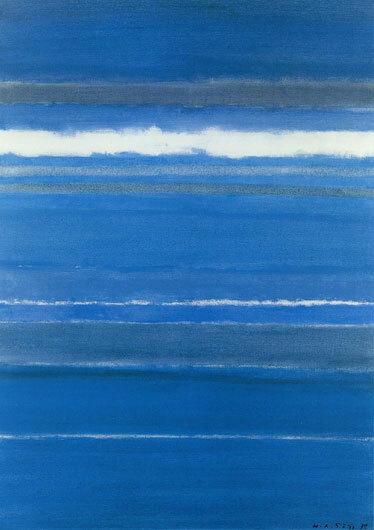 In Sea and Sky II (1979), as in other works of this structure, Sigg fuses the realms of earth, air and water in an ethereal, somewhat mystical, image, created by nuanced brushwork, color, and light. Soft blue and grey zones are rendered atmospherically. Downy white bands and lines, analogous with clouds and mists, stretch across the image’s horizontal axis, implying their continuation beyond the space of the canvas and emphasizing the object’s surface. At the same time, the zones move up and down the picture plane’s vertical axis in registers that seem to continue and expand beyond the image’s top and bottom edges. There is movement in all directions: on the surface of the image and in the depth of the atmospheric color that absorbs and reflects light. The image, no longer a “picture” in the traditional sense of the word, has a delicacy, simplicity, and peacefulness about it that encompasses and embraces every direction and dimension. 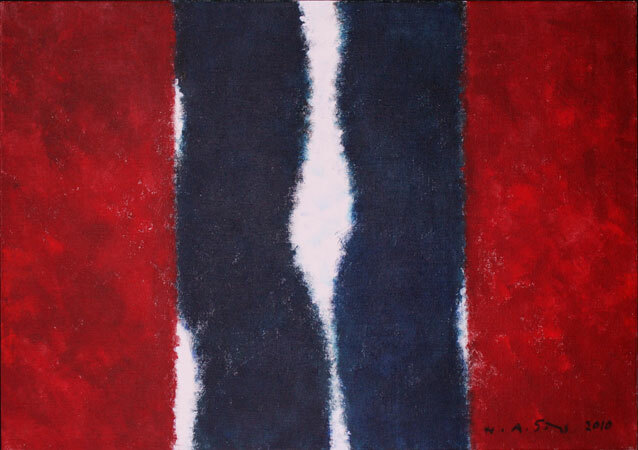 Like the art of those painters, Sigg’s art radiates an inner light that transcends the light and boundaries of the natural world, even though it is distinctly different in form and content. Narrative, drama, and literal representation of nature are absent, reduced, both literally and figuratively, to only a few elements. The theme of the “sublime” and a rejection of literalism were also espoused by the New York painters—particularly Newman and Rothko, who spoke about their work in terms of the “tragic and the timeless,” relating it to the terror and ecstasy of the sublime. Sigg, both an observer and a thinker, crossed the boundary of the symbolic order into the world of the sign. From the start, Sigg focused on the themes of land, sea, and sky. 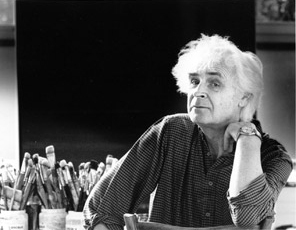 But in 1968, after an unusual arrangement with Swiss Air in payment for his art, he flew to China, India, and Southeast Asia, and viewed the Asian subcontinent from the plane’s cockpit. This experience changed his perspective, shifting it from a terrestrial to an aerial view and altering his interior vision as well. Views of rivers and cultivated fields seen from above at times recall the themes and devices, if not the traditional representations and idioms, of classical Chinese and Japanese landscape scrolls: the omniscient eye looks down through clouds upon a scene below that shows a diminutive figure, almost imperceptible, the artist-scholar or the poet merged with the landscape, on a path leading to a mountain retreat, to contemplate nature, practice calligraphy, write poetry, and cultivate enlightenment. Sigg’s images in this series are global views of gold, green, rust, and red patchworks. 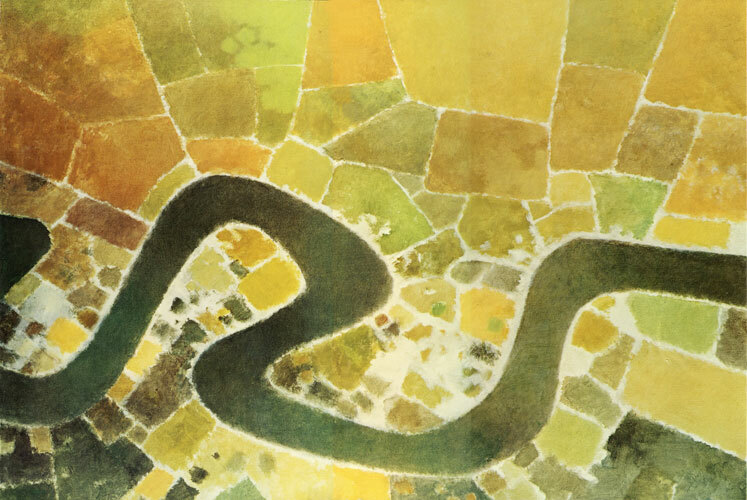 River Meanders III (1976/84) Sometimes they morph into shimmering aqueous mosaics, molecular-looking and reminiscent of the refraction of light underwater. 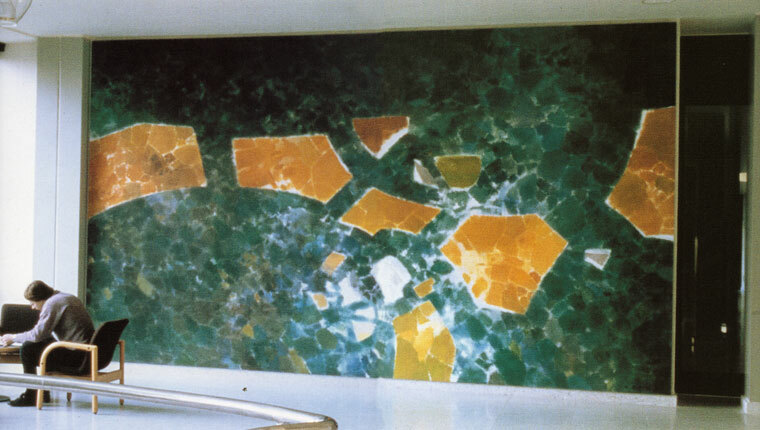 Mural, University of Zurich (1981) In The Green River in the Ripening Fields (1976) we gaze down upon the artist’s shorthand for rotated fields. Like reflected sunlight, the empty white spaces of the canvas break through the edges of the irregular rhythmic pattern of tinted shapes of color. Rivers meandering or winding, snakelike, along the picture’s surface are signs of art and memory, symbols of life’s flow and flux. 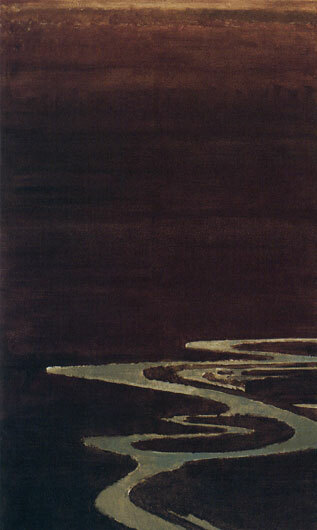 In The Course of the River V (1985) and other works of that series, the sinuous image of the river becomes a calligraphic sign. Seen as if from a distance, it is a signifier of the past; or the future, the path that winds ahead. Brought up close to the bottom edge or on the surface of the picture plane, it may signify the present or presence. In the Land of the River V (1993) Always there is a suggestion of the space outside of and beyond the edge of the frame. On the ground in Asia in the first and in subsequent journeys, Sigg’s attention was drawn to architectural elements and artifacts of monuments he visited—temples and sites—in Cambodia, China, India. Simultaneously, he began developing the motifs of the glyph and the cipher, like inscriptions seen on plaques and dedications. Fire, now more than the heat of the sun, appears in characters made with angular black strokes—a variation on the sign of the river—a lightning bolt that reverses the tonal polarity of nature’s own calligraphy. Sometimes it is a lone gesture unanchored on a field of color. 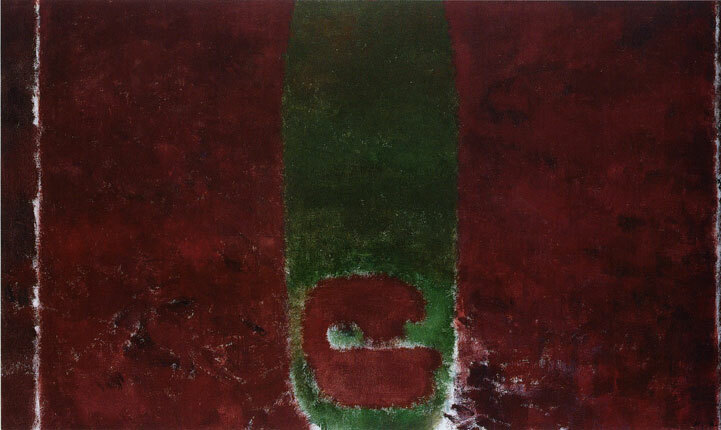 In the Middle Realm XVI (1997/98) Sometimes it is contained within a cartouche or plaque. 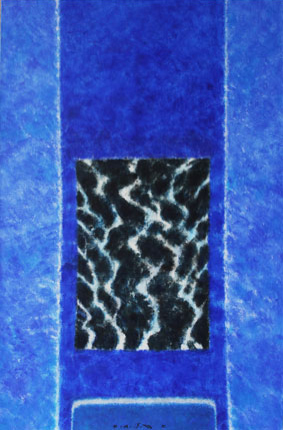 Under the Sign of the River III (1990/91) Sometimes it adds other characters, developing a pseudo-calligraphy of further significance—the ineffable code of the artist. Magic of the Signs II (2008) Nature was its beginning but not its end. Sigg’s work ventured into the field of form as visual symbol, beyond concrete referents or words,12 developing a vocabulary of elementary forms as abstract surrogates for things he saw in his journeys. Monumental forms—temple doors, pillars, altars—are reduced to simple shapes–the rectangle, the square, the cylinder13—operate on the surface of the picture plane, and lose their lithic mass but gain iconic weight and singularity. Sigg’s attraction to the East is not coincidental. His evocative landscapes of the mind and spirit were born of longing—an “astonishing delusion that flees from itself while seeking itself”; a journey rooted in the encompassing power of nature, free-falling into an other sort of time and space. The call of Asia is unmistakable, with its mysterious caves and temples that open onto Taoism’s mystical vision of the unity of nature, the secrets of the I Ching, Buddhism’s quest for simplicity and essence, the eight-fold path that strips the ego of desire to find a perfect balance in Nirvana, the heavens above heavens, the embrace of complements. Symbols of ideas present in glyphs are simultaneously visual and lexical, with resonant equilibrium and vibrant serenity. Imagine you are an artist, like Sigg, who grew up in the High Alps, dominated by nature, searching for a way to express your mixture of awe, revelation, epiphany in the face of the extraordinary. It’s no wonder Sigg wished to fly, to look down upon the earth from a point higher than the iconic Jungfrau itself. He was predisposed to that vantage point from the start. 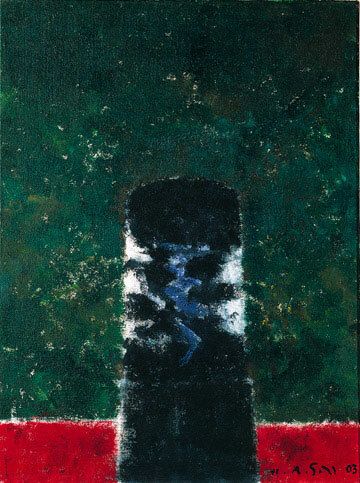 And yet, as an abstract painter, he abandoned all reference to literal reality and created structures that might be likened to the abstractions of Hindu religious belief and practice, for instance, in Angkor Wat. A yantra depicts “both macrocosmic and microcosmic forces acting together—the movement towards and away from the center—‘control’ and ‘liberation’ within the one device. It is sometimes believed to be a mystical or astronomical diagram (usually a symbol, often inscribed on an amulet).”15 Not to imply that this was Sigg’s method or something about which he was thinking. The structures, the scaffolding of his paintings, the primary forms with which he develops his art—the ‘river’, the ‘door,’ the ‘plaque’—do not bear any visual resemblance to these Hindu geometries. 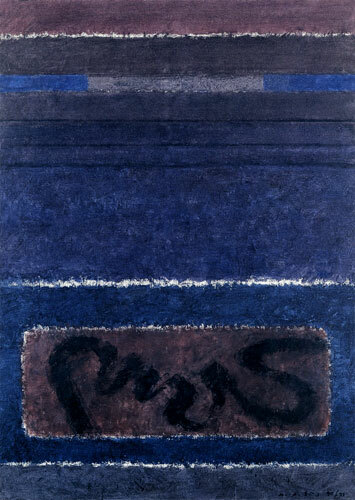 In the most minimal way, Sigg’s rectangular ‘doors’ emphasize the vertical axis of the painting. But are the doors opening, or partly open; closing, or partly closed? Are we standing outside looking in or inside looking out? Green Room (2004) Forms mirror and overlap in ambivalent figure and ground relationships and invert expectations about the behavior of color and orientation of the natural order. 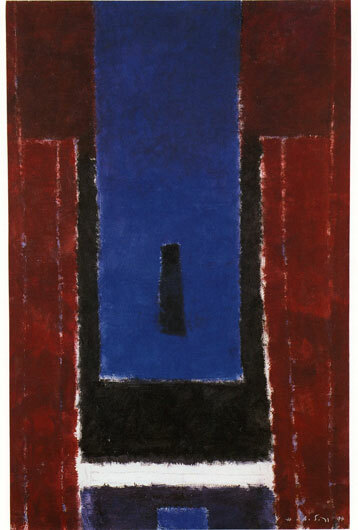 Viewing In the Middle Realm IX (1994/95), a midnight blue shaft hangs from the top of the image, projecting then receding as we focus on a small dark ‘door’ within its frame. A feathery white band at the bottom contains a shadowed encasement in and on which another shaft sits, mirroring the one above in reverse. While abruptly cut off at the edge, it also suggests that it is the beginning of a new shaft, like the reiterating frames of photographic negatives. Continuing beyond the edge, it suggests a circular return—perhaps the eternal return about which philosophers speak—while also doubling as an epigraphic plaque inscribed with—or here empty of—signs of nature, culture, or memory. 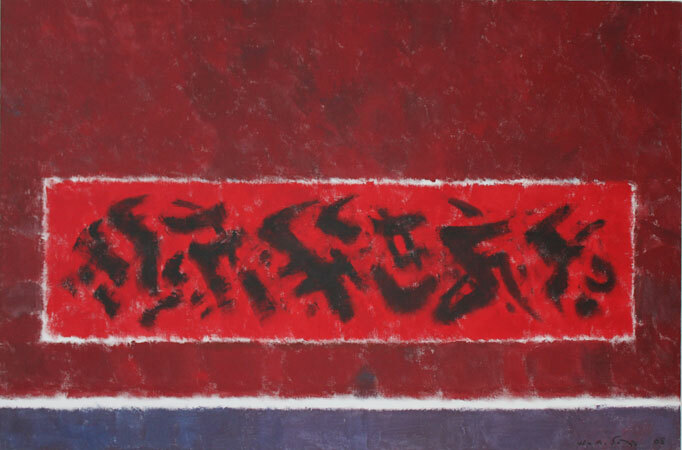 The painter has become a scribe, writing his own language in form and color. At other times our eye is redirected to the horizontal axis. Downy white lines drift on textured fields of blue, anchored below by a brown plaque inscribed with the sign of the river, equating with earth’s gravity yet paradoxically weightless. 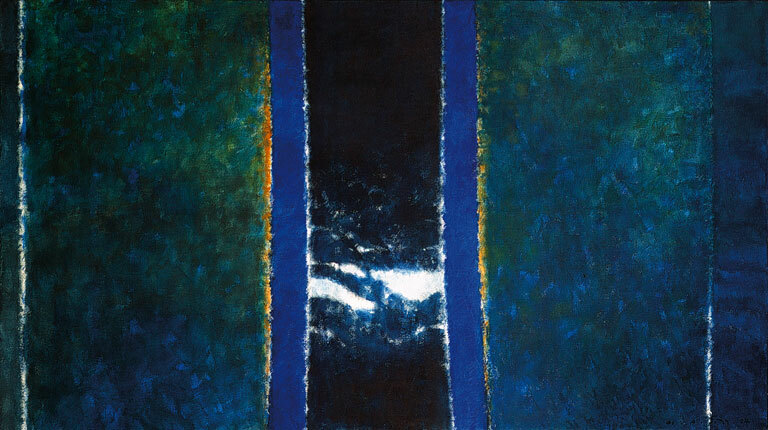 Under the Sign of the River III (1990/91) The painter leads us along a path of visual experience in synchrony with his own experience and personal code. What is striking, however, is the empathy of Sigg’s work with the concept of the yantra, arrived at in his own way—from the “movement towards and away from the center,” to the nesting of signs inscribed inside slate-like plaques or tablets, to the image that ‘holds’ the essence of a concept and helps the mind to ‘fasten’ onto a particular idea, to the inner light that illuminates the image. Amy H. Winter, Director & Curator at the Godwin-Ternbach Museum, Queens College, CUNY, since 2001, has worked as a museum professional for over 25 years. Previously, she worked as an executive administrator at the Metropolitan Museum of Art (1979-1983); lecturer and consultant at the Whitney Museum (1987-1992); Curatorial Consultant for The Jewish Museum (1981) and Curator and Educator at the Block Art Gallery, Northwestern University (1997). She received her PhD from the Graduate Center of the City University of New York, with specialization in modern and contemporary art history, theory and criticism, and crosscurrents of western and non-western art and culture. From 1987 through 2002 she taught at Parsons School of Design, SUNY New Paltz, and CUNY CSI and Queens College. Among the fellowships awarded for her work are the Luce Foundation for American Art, the Samuel H. Kress Foundation and the Smithsonian Institution; and residencies included the Camargo Foundation and the Pollock-Krasner Foundation. Her monograph on the Austrian Surrealist Wolfgang Paalen, Artist and Theorist of the Avant-Garde (Praeger, 2003) received wide critical attention; and she has published and presented in international journals and symposia. She has curated over 35 exhibitions and published numerous catalogues for the Godwin-Ternbach Museum. 1 Ernst Cassirer, The Philosophy of Symbolic Forms, trans. Ralph Manheim (Yale Univ. 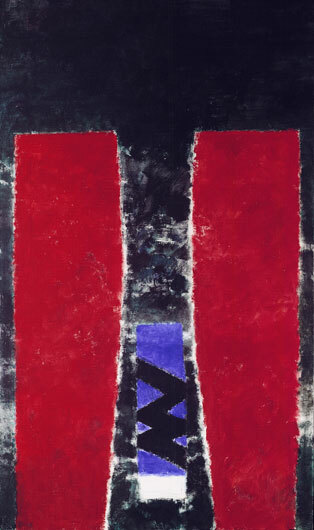 Press, 1970) II, 8-9. 2 In classical Western physics, aether was “the material that fills the region of the universe above the terrestrial sphere.” Alchemy, natural philosophy, and very early modern physics saw aether as the fifth element or “quintessence” and the luminiferous aether as the medium through which light propagates. Subsequently light was likened to two macroscopic metaphors – particles (atoms) on the one hand, and waves on the other, giving rise to the “wave-particle” theory. Although visible only on a microscopic level, all are related to electro-magnetic light, radiation, and color. From the 5th to the 7th century, Indian Buddhists viewed light as an atomic entity equivalent to energy. Thus both scientifically and metaphorically, visible light has powerful energies of movement, heat and color, and properties of absorption and reflection, used to great effect by artists, whether intentionally or intuitively.http://en.wikipedia.org/wiki/Light. 3 John O'Brian, Clement Greenberg: The Collected Essays and Criticism. 4 vols. (University of Chicago Press, 1986, 1993). 4Harold Rosenberg, "The American Action Painters" in Tradition of the New (New York: Da Capo Press, 1994) 23-39, originally in Art News 51/8, Dec. 1952: 22. 5 Of all the New York artists, it was Adolph Gottlieb who seems to have most shared Sigg’s interest in the rapport between language and image. Gottlieb’s pictographic work is just a step away from an investigation of the sign. In Paris and other capitals, Klee, Miró, and many other artists interested in alternatives to European painting traditions were also aware of Ferdinand de Saussure—“the father of 20th century linguistics”—and his theory of semiotics—or the functioning of signs. Saussure taught at the École pratique des hautes études in Paris from ca. 1895 to ca. 1905 and at the University of Geneva thereafter. Sigg knew something about Saussure’s ideas. (Author’s conversation with Daniel Sigg, Sigg’s son, June 28, 2012). 6 Tapié’s treatise Un art autre (1952), discusses this philosophy and practice. Michel Tapié Un art autre: où il s'agit de nouveaux dévidages du réel (Paris, Gabriel-Giraud et fils, 1952); translated in Herschel B. Chipp, Theories of Modern Art (Berkeley: University of California Press, 1968). 7 Vertical Thoughts: Morton Feldman and the Visual Arts (Dublin: Irish Museum of Modern Art, 2010). 8 Robert Rosenbaum Modern Painting and the Northern Romantic Tradition: From Friedrich to Rothko (London: Thames & Hudson, 1975). A Mirror of Nature: Nordic Landscape Painting 1840-1910, (Copenhagen: Statens Museum for Kunst, c. 2006). Kirk Varnedoe, Scandinavian Chiaroscuro: Northern Light, Nordic Art at the Turn of the Century (Yale Univ. Press, 2011). 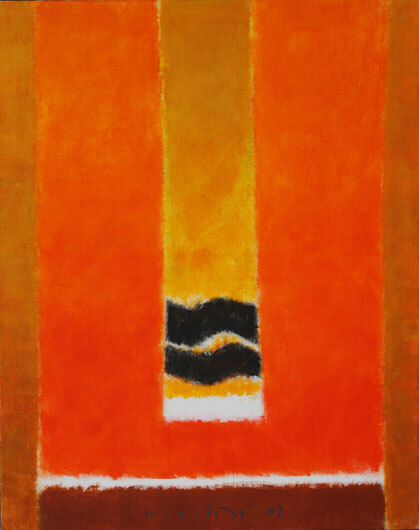 Patricia G. Berman, Luminous Modernism (New York: American-Scandinavian Foundation, 2011). 10 André Lhote, Treatise on Landscape (Paris: Editions Floury, 1939). 11 Wolfgang Paalen, “The New Image,” DYN (Mexico: 1942): 9; reprinted in Form and Sense (NY: Wittenborn, 1945). 12 Ernst Gombrich, “Visual Metaphors of Value in Art,” in Meditations on a Hobby Horse (Greenwich: New York Graphic Society, 1963). I am indebted to the work of the scholars of Sigg’s art that gave me access to the artist’s career, but particularly to the insights of Margaret Mathews-Berenson, whose thinking struck a chord with mine. Berenson, Margaret, and Hermann Alfred Sigg. H.A. 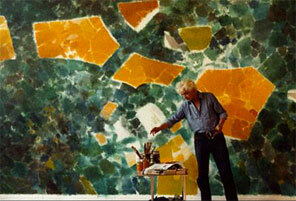 Sigg: new paintings and collages: March 24 - May 7, 2005. New York: Kouros Gallery, 2005. Billeter, Fritz. H. A. Sigg: Monographie. Bern: Benteli, 1998. Donohoe, Victoria. "Swiss Artist Uses Land as His Muse." The Philadelphia Inquirer, May 12 2002. Frank, Peter. “H. A. Sigg, Albert Contreras.” LA Weekly, January 26 - February 1, 2001. "H.A. Sigg's Online Gallery." H.A. Sigg / Classic Modernist. unpg., n.d. Web. April 2012. http://hasigg.com/portfolio.htm. Helber, Annabelle Masser. "Abstract Rebel." Dallas Observer, September 28 - October 4 2000. Marger, Mary Ann. "One Artist, a Century of Influences." St. Petersburg Times, April 29 2001. Naves, Mario, and Hermann Alfred Sigg. H.A. Sigg: recent works, December 2-30, 2010. New York: Kouros Gallery, 2010. Panettta, Gary A. "His Passion Gives Creations Soul." Peoria Journal Star, February 13 2000. Sigg, Hermann Alfred, and Eduard Hüttinger. Hermann Alfred Sigg: Bilder und Zeichnungen aus Südostasien = Hermann Alfred Sigg : paintings and drawings from South-East-Asia. Zürich: Orell Füssli, 1976. Sigg, Hermann Alfred, and Robert M. Murdock. H.A. Sigg: recent work. 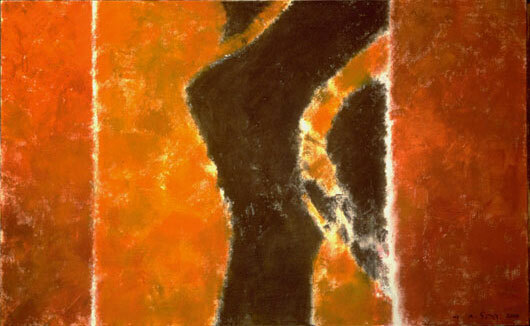 New York: Margaret Mathews-Berenson Fine Arts, 2000. 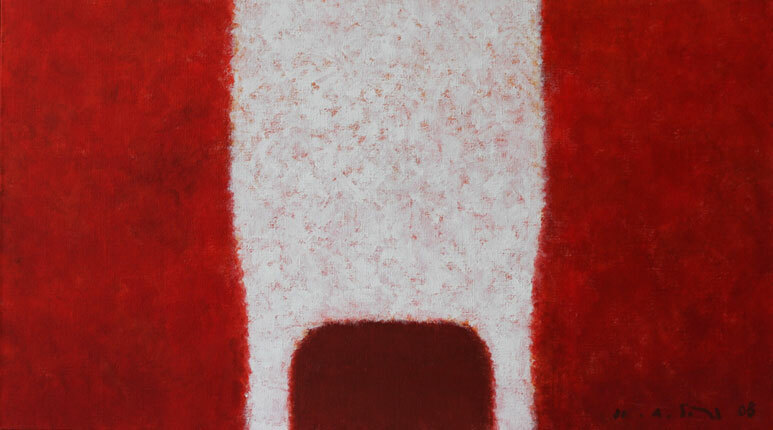 Smith, Roberta, "Aerial Perspectives–Imagination, Reality and Abstraction." The New York Times, Aug. 1 1997. Tynes, Teri. “Reviews South East: Clemson.” Art Papers Magazine, May/June 2002. Wasserman, Burton. "New Works by Sigg Now Here." Art Matters, April 2002.